Who in the world doesn’t love pizza? Everyone seems to have grown a fondness for that doughy flatbread layered with juicy tomato sauce and topped with meat and fresh herbs. It has somewhat become a staple food during parties, simple hangouts, and especially after a drunken night out. And since everyone has quite a liking to pizza, businessmen have taken advantage of that and built pizza houses in every corner of the world. If you are planning to start a pizza business, it is important to establish a unique pizza style and taste—a house special. Aside from the taste, you should also ensure that you have a clear presentation of the selection that you offer so that people can easily pick what they would like to order from you. Your pizza menu should include the name of the pizza, a list of the major ingredients, available size, and the corresponding price for each size. Having a comprehensive menu will help in ensuring that people would always come back. Having a menu that presents all the necessary information about the product that you offer will help achieve a better customer experience. It will help customers decide what they would want to order based on the details that you add on your menu. Thus, it is best to logically organize the information in the menu from the pizza name and description, size, and price. 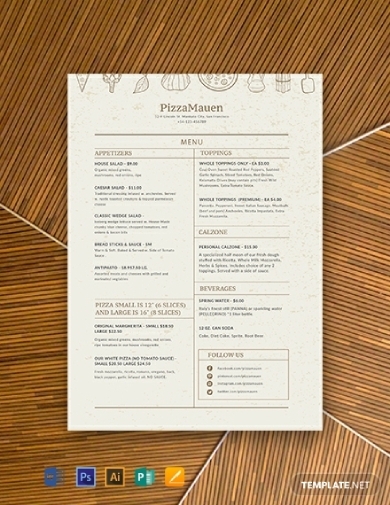 If you are looking for an editable pizza menu template, you can download this one and edit as you see fit. 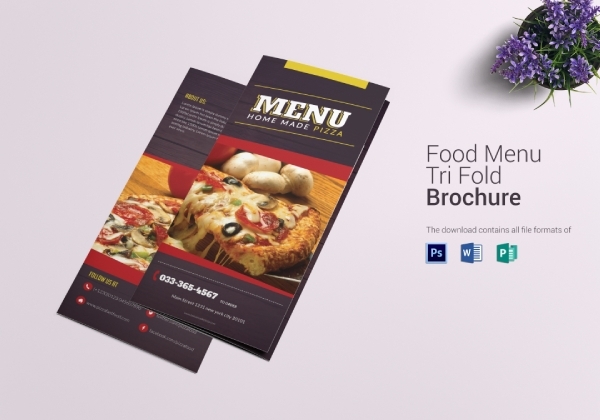 Aside from the ordinary one-page menu, you can also use a trifold brochure format for your pizza menu. That way you can add more details on each pizza styles and flavors. You can also incorporate more images in this format which helps in stimulating a positive response from the customers. 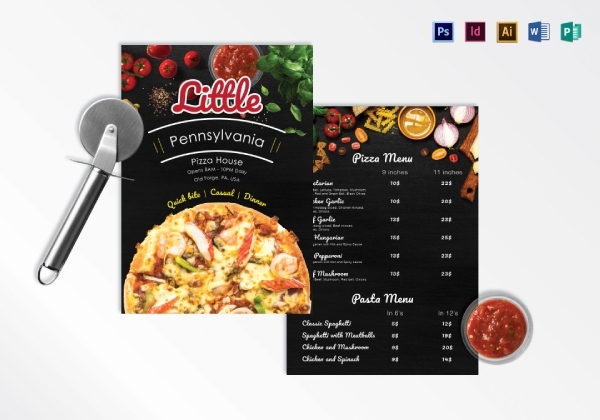 We have here a downloadable high-quality trifold pizza menu template that features original designs and artworks, and a flexible layout that you can easily customize. 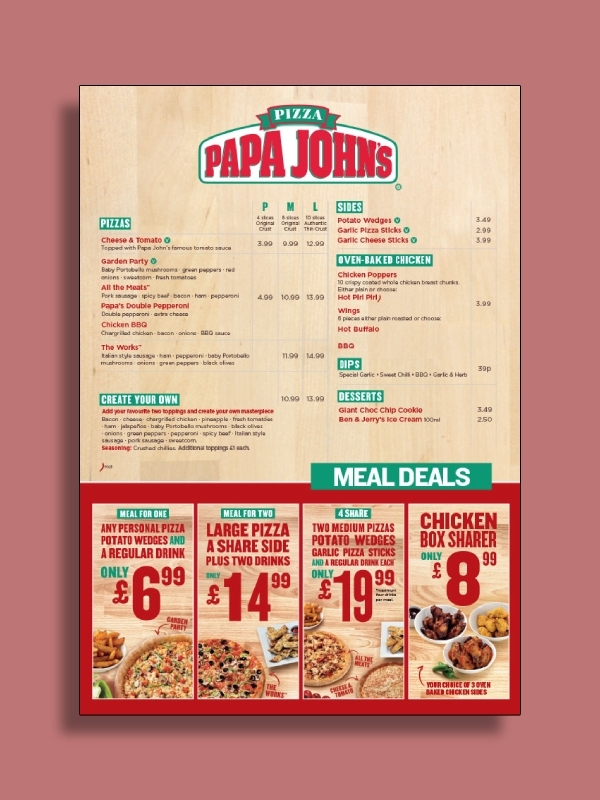 Just like a trifold format, using a bifold brochure format for your pizza menu will also help you include more product images and details about the food that you offer. 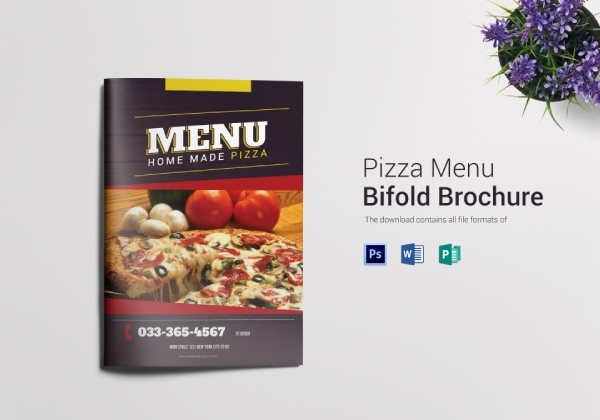 A bifold pizza menu will help you strategically arrange the food that you offer to ensure that the customer has a clear and encouraging guide to flip through when they start to order. Should you like to use this format, you can download and edit this template in MS Word and Publisher, and Adobe Photoshop. Aside from providing a clear list of items you have to offer in your menu, it is also a great tool that you can use to market and promote your business as a whole. 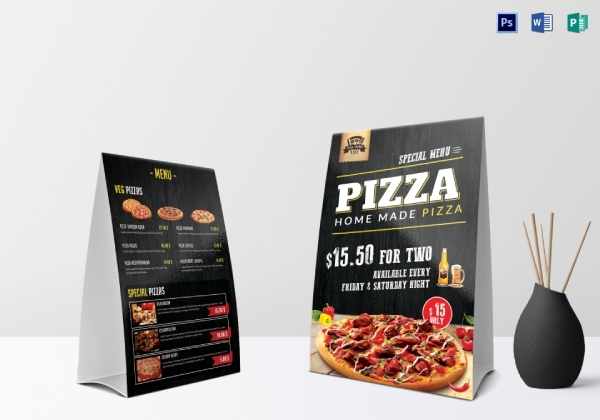 Thus, using a table tent as a menu in your pizza business hits two birds with one stone—present products for sale and advertise your business. If you would like to use this type of menu format, you can download this template and edit its designs, illustrations, and layout to suit your brand identity. You can’t have an Italian restaurant that doesn’t include pizza on the menu. Pizza is an original Italian dish that has greatly become people’s favorite aside from the classic pasta dishes. Thus, you need to incorporate pizza in your menu to present a full Italian experience to your customers. But how can you flawlessly include pizza in your Italian menu? Fret not, we have here a well-structured menu that can be used not only for pizza dishes but also for other Italian cuisines. Papa John’s is a famous American pizza restaurant franchise that is available in almost every country in the world; it is the fourth largest pizza delivery restaurant chain in the United States. With that said, you would come to wonder how the company was able to sustain such a long run in the business. One of the answers is a well-planned menu. Their menu features a simple layout and design that allows them to emphasize their house specials, as you can see in this example. Another American pizza chain restaurant that has become famous worldwide is Domino’s Pizza. The pizza restaurant has been in the market since 1960 and has no signs of stopping just yet. As you can see in this pizza menu example, the restaurant only features seven pizza choices which adhere to the psychological theory known as the paradox of choice; that way they don’t overwhelm customers when choosing which type of pizza to order. This must have been the reason why people always keep coming back and has helped the company continue to thrive after all these years. The templates we have provided in this article are all downloadable and easily editable to help you create a creative and enticing pizza menu for your business. 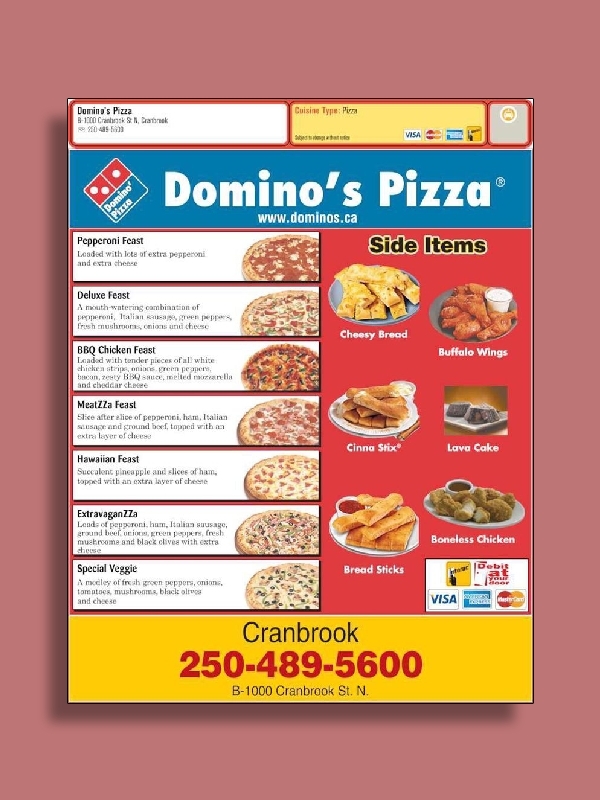 We hope we have provided inspirational and helpful pizza menu templates and examples for you to use.